To demonstrate how Izak9 works, let’s showcase a task. 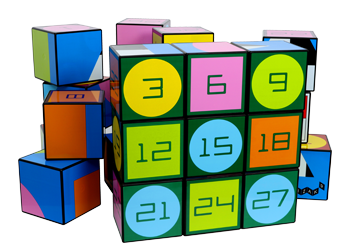 This task allows children to build a relationship with the set of PRIME NUMBERS. Here’s Abacus and Helix introducing the task from the whiteboard. Pupils work together in small groups, to complete the task. Teachers can access a series of questions for this and all of the available tasks from a range of online support material, all of which is colour coded to show progression and degree of difficulty. But first, let’s see what skills Izak9’s use develops.